What Battery Pack Do I Need for my Travelpro® Crew™ 11 Bag? 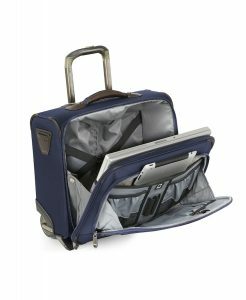 One of the new innovations for the Travelpro® Crew™ 11 Collection is that several models, including our popular 22″ Expandable Rollaboard®, feature on-the-go charging for electronics. The luggage has an external USB port and a dedicated, zippered Power Bank pocket on the side designed to hold a battery pack. This means you can charge your mobile phone or tablet while you’re waiting for your next flight. You’ll need to provide your own charging cable, which you connect to the external USB port on the back side of the bag, just below the Powerscope extension handle. That port connects, through a hard-wired connector cable inside the bag, to a separate battery pack placed inside the Power Bank pocket. However, the Crew 11 bags do not come with a charging battery. So what should you consider when purchasing one to drop into the pocket whenever you travel? A wide variety of chargers are available on the market, and each has its own pros and cons. 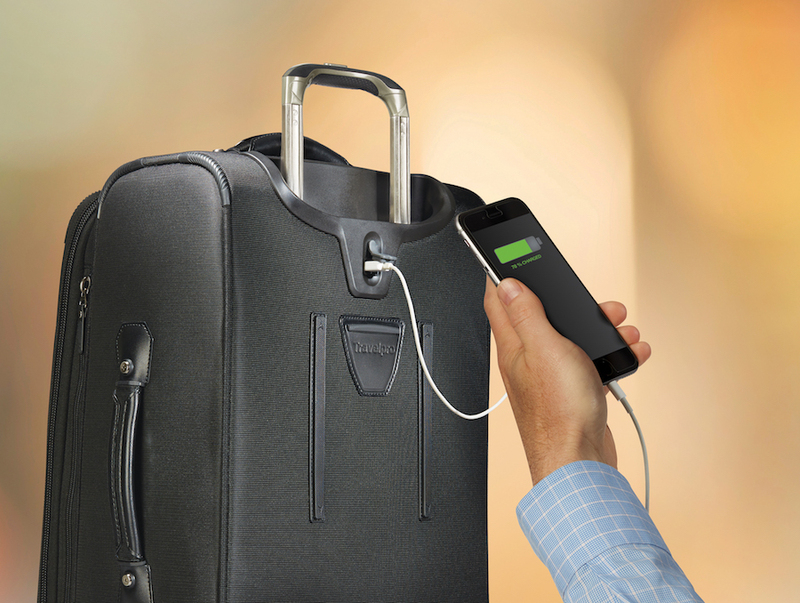 In our opinion, sufficient power for charging multiple devices is the most important consideration when looking to utilize this feature of the luggage. You want to look for the number of milliamp hours (mAh) the battery has. The higher the number, the longer the battery will last between charges. Travelpro has partnered with battery maker Incipio to offer a thirty percent discount card for those who purchase the Crew ™ 11 models with the charging feature. Incipio’s batteries range from 1500 to 8000 milliamp hours (mAh). With so many travelers trying to streamline what they use to manage their essentials, knowing all your “personal item” luggage options could make what you carry onboard more efficient. Maybe you’re checking a large suitcase, but still want to take a small personal bag on the plane with you. Or maybe you’re only traveling for a single overnight trip, and a normal rollaboard is too big. This is where a tote can help out. They’re smaller, lighter, and easier to carry or roll. Here are a few features you should look for in a travel tote. First, just because a tote is lightweight doesn’t mean it shouldn’t be durable. A good tote won’t sacrifice quality and durability for the sake of being lighter. For example, we make our Crew™ 11 Deluxe Tote with the same high-quality ballistic nylon fabric as our other Crew 11 luggage. It’s also thoroughly tested to withstand the same rigors of frequent business travel. Your tote should also be comfortable to carry. Look for an adjustable strap with a padded shoulder pad so you can wear it hands-free, either over the shoulder or across your body. Look for leather handles so it’s comfortable to carry as well. 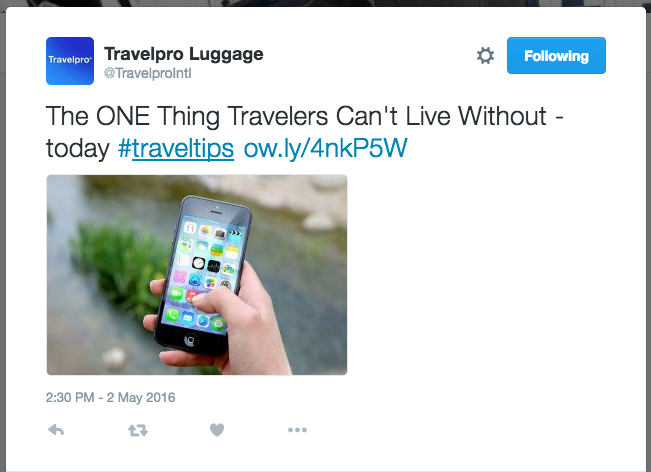 Share your travel story for a chance to win a two-piece Travelpro® luggage set! 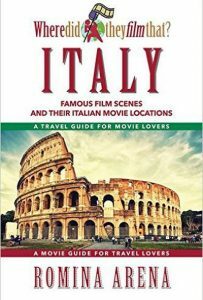 Have you ever watched a movie like Roman Holiday, The Talented Mr. Ripley, or The Bicycle Thief, and wondered where they filmed it? The answer is “Italy,” of course. But where? In many of these films, Italy has been the silent character that says so much. Only the streets of Rome, Florence, Palermo, and Milan can truly portray the country in a way no movie set ever could. To showcase her country, Italian singer, Romina Arena, the “Queen of Popera,” is releasing her first book — Where Did They Film That? : Italy — as a way to show movie fans where some of their favorite movies were made, and the must-visit locations in the area, like restaurants, museums, and hotels. The book is set to be released in May 2016. Travelpro is partnering with Arena to help celebrate her new book with the Where Did They Film That? : Italy sweepstakes. We’re giving away a 2-piece set of Travelpro Platinum Magna 2 bags to the winner — an International Carry-on Spinner and a 29″ Expandable Spinner — with an MSRP value of $1,400. We like to share travel tips to help you travel better and safer. Travelpro® and Atlantic® Luggage, two of the most prestigious brands in the travel industry, are proud to present the much-anticipated 2016 Mother’s Day Gift Guide. Finding the perfect gift for your wife or mom can create anxiety every Mother’s Day, which is why Travelpro and Atlantic make your life easier with luggage selections that the special women in your life will delight in, not only on May 8th, but for years to come. The first two pieces featured in the Guide are the creative and value-conscious Atlantic® Unite™ 2 21″ and 25″ Spinners, available in durable black and blue fabric colors. 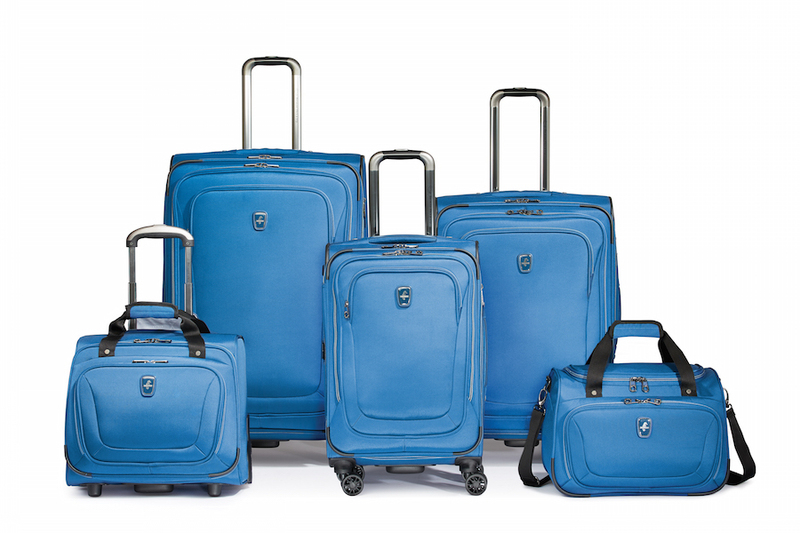 You will be amazed by these offerings from the market leader in lightweight, affordable luggage. These Unite 2 Spinners have design innovations such as the Link2Go™ System which easily connects luggage together with Velcro straps, so you can push two pieces with one hand. Atlantic goes the extra mile with the addition of an external USB port and integrated battery pouch in the Carry-On Spinner model, which provides convenient access to power your phone and tablet on the move. Masterfully versatile, the affordable Unite 2 collection gives you a choice of ideal gifts for family travelers who need an extra hand and electronic devices that are always available for immediate use. 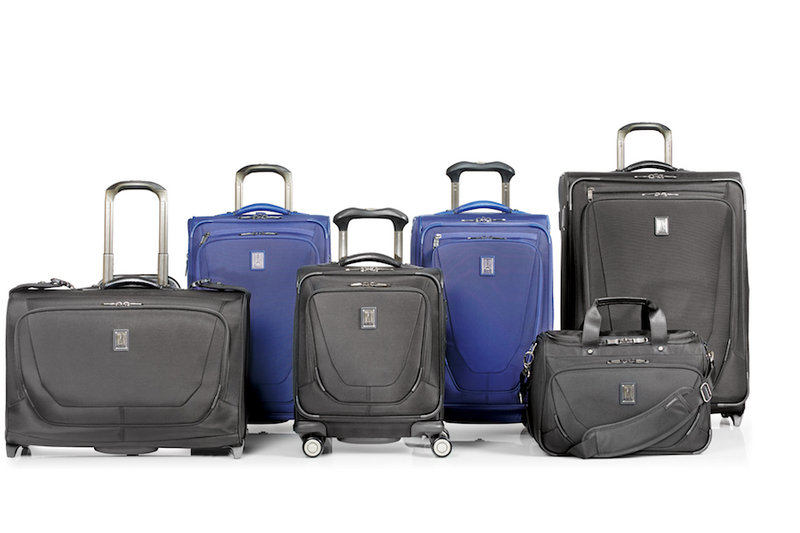 Travelpro, the leader in luggage known internationally for being pilot designed and flight crew tested, is proud to introduce its bold new FlightCrew™ 5 collection. Sure to satisfy the most discerning travel industry professionals, this luggage stands out from the crowd for its uncommon durability, creativity and functionality. Proud of its reputation for innovation, Travelpro is always listening to flight crews for ways to improve its luggage while setting the industry’s highest quality standards. 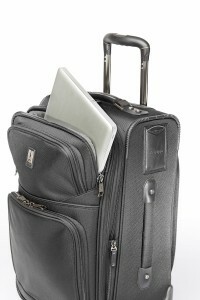 The FlightCrew 5 rollaboard has a laptop carrier as well. In keeping with its demand for exacting performance, Travelpro conducted rigorous testing on all features of this 17-piece collection to ensure a smooth ride and unmatched reliability. The testing of the main mechanical parts: the extension handle up and down cycle test, the zipper reliability test of open and close cycles and the wheel high mileage test on rough terrain were all conducted to meet the highest standards. The Travelpro® FlightCrew 5 collection was also examined for its endurance by the 70 lb drop test in below 0°F tempe ratures, fabric tensile strength test, fabric surface abrasion resistance test and water repellency test, all adding to its appeal to the durability needs of the professional traveler. 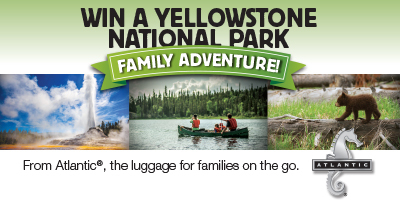 Ideal for families who like to travel and have a scenic adventure, the Atlantic sweepstakes is offering the chance for a grand prize winner and three guests to win a fabulous trip to Yellowstone National Park. The winner will receive a trip certificate that includes roundtrip airfare for four (4); three (3) nights in a 3-star Cabin at Yellowstone National Park; Four (4) 1-day passes with admission to Grizzly & Wolf Discovery Center attractions; $500 cash spending money; and four (4) Atlantic carry-on sized suitcases. The sweepstakes begins October 1 and ends October 31h, 2015. To enter or view the official sweepstakes rules please visit: No purchase or payment is necessary to enter or win.